Baby, it’s cold outside!! This polar vortex is something else. Is it sub-zero where you are? 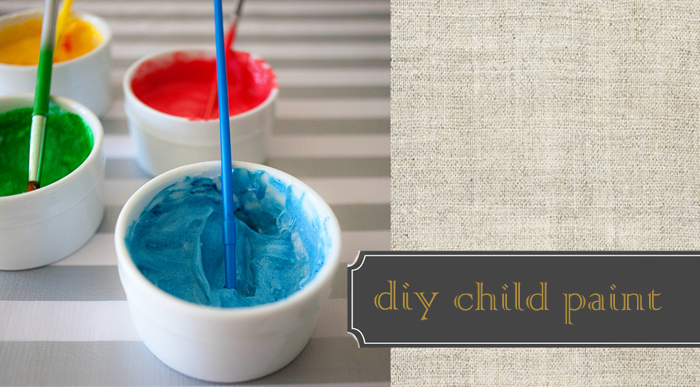 During the long winter months I am always looking for projects to do with my little ones indoors. I know you are too. 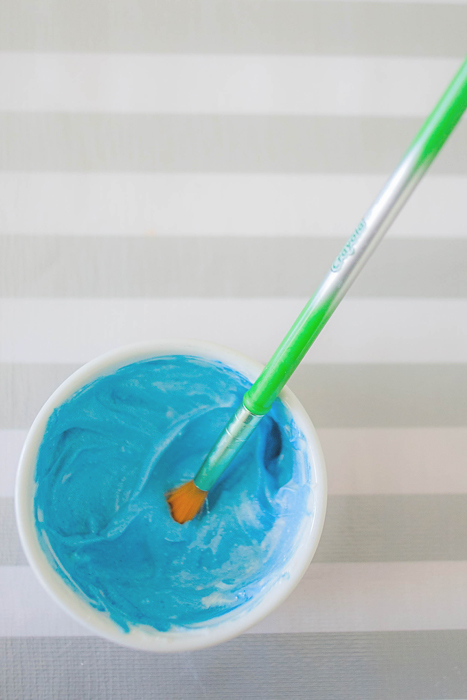 This diy paint could not be any easier (2 ingredients). It washes easily off surfaces and kiddos. It is even safe to eat. 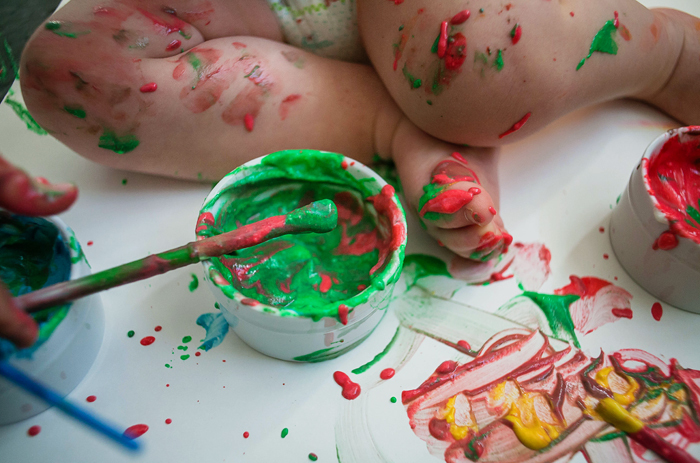 It works equally well as finger paint or with brushes. To make your own paints, just put a few heaping tablespoons of plain yogurt in each of several individual dishes or ramekins. Add 5-7 drops of food coloring to each bowl and stir well. It is, of course, quite messy! But it wipes up well! I plopped my babe down, in only a diaper, with an big piece of poster board. The paint wiped clean from the floor and baby with warm soapy water. 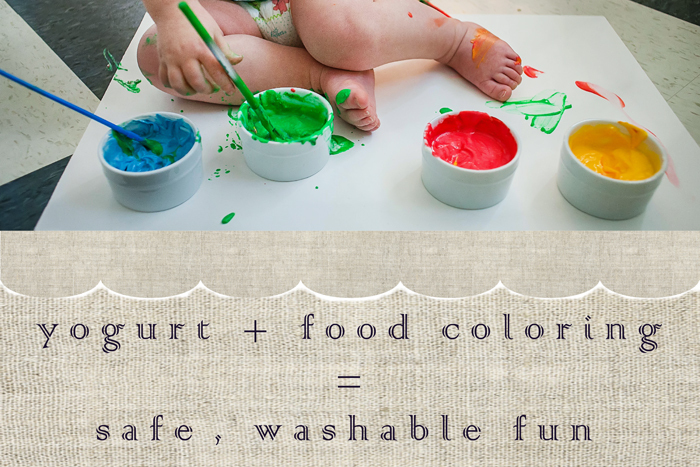 You could certainly make smaller amounts of each color (try 1 tablespoon of plain yogurt and 2 drops food coloring) for brush play to better contain the mess. Or you could do as I did and let your little one go crazy while you sit and enjoy a hot cup of coffee on a cold winter day. My 1 year-old played with these paints long enough for me to look through a decorating magazine and drink a full cup of coffee (without reheating!!) Oh heavenly day! In the end he was crowned King of Messes, but what can I say? He wears it well. What do you think? Would you try this at home? BRILLIANT! Wow. I would never have thought of this!! what fun that sweet boy had with his safe paint. Hey Tara!! Always happy when you drop over! I applaud you! I admit, I’m on babe #6 and still try my best to avoid these messy situations, but I really should lighten up. He sure makes that look fun, I think we will give it a whirl. Oh, he’s adorable in the mess! I was a lot more willing to let my first born make these kind of creative messes when she was that age than I am with my second. 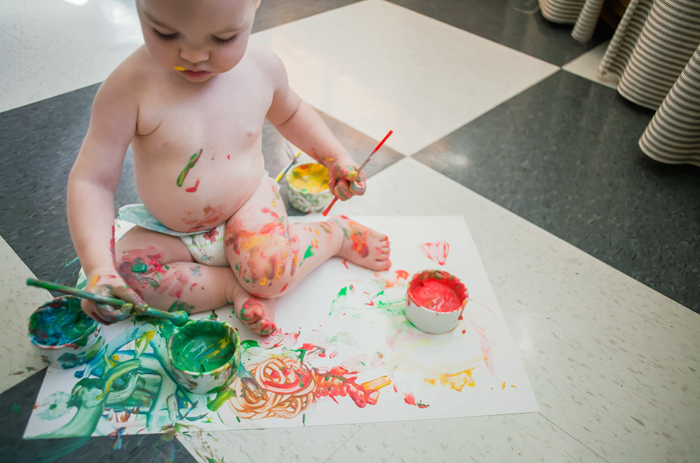 It helps that he’s one of those kids who can’t stand to get messy 😉 I love your floor too! I love this! 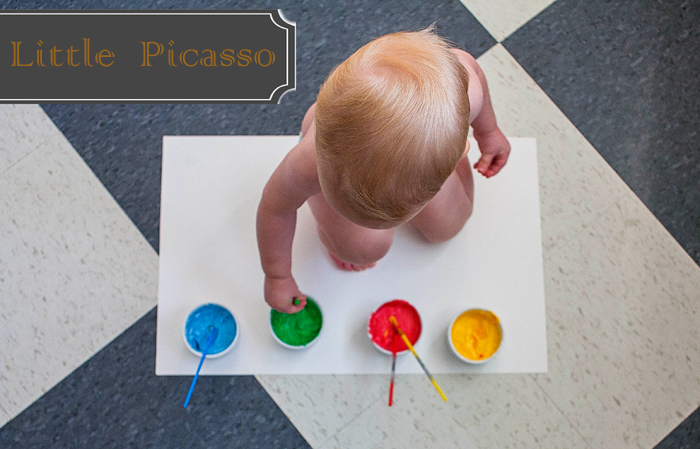 My kids love to paint and I will definitely be trying this out.